I have approximately 250 comic books for The Might Thor, issues 1- 500 something, which ended in the 90's. I have been collecting them since I was 15, and now they are just sitting in the closet in protective bags. The condition, in my non-expert opinion, ranges from poor to good. I do not believe I have any excellent. I know that I have purchased some for as much as 15 dollars, and many were through original subscriptions, and many were picked up a comic book fairs along the way. I also have a G.I. Joe #1 from the 80's. Editor's reply: Thanks for writing and sorry for the long delay in replying, LOTS of comic book appraisals coming in every day! 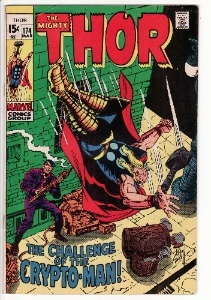 Unfortunately the condition of Thor comic books is vital. Apart from Journey Into Mystery #83, which sells strongly in any condition, and a few of the other early JIMs, they need to be in near mint or better condition to have real value. That said, it sounds like a nice collection, and for somebody who's looking to pick up a run of reader copies to catch up with the storyline, it would be a good find. Probably worth $1-2 per comic. The shipping cost will put a lot of people off. Try advertising locally or on eBay. See values of similar collections here, and thanks for sharing! Trying to sell to an avid Thor fan?